5. Flight Engineer Sgt Oates (both Flight Engineers had flown with this crew). Dated after 06 October 1944, but before 29 Dec 1944 when F/Sgt King was commissioned to the rank of P/O. The absent Nav Godwin was in Hospital for a day or two, which narrows the date to 18 or 19 or 20 November 1944. Crew 30 – 462 Squadron, Driffield. In September 1944, after just 2 weeks and four Ops with 462 Squadron, Driffield, this crew was re-posted TO 466 Squadron, Driffield. The photo at left, labelled as Crew 160 of 466 Squadron, was taken outside the Respirator Workshop, Driffield, sometime during the winter of 1944-1945. It was supplied by the 466-462 Squadrons Association, Sydney, via John McManus. Not included was the original Rear Gunner, Sgt Higgison, who was killed on the crew's second Op at 466 Squadron on 06 October 1944. R/AG Glenister was his replacement, also from 462 Squadron. The original Navigator, F/Sgt Godwin was absent due to an injury. At 466 Squadron, the crew's 2nd Rear Gunner was Sgt W A (or W H) Glenister, also previously at 462 Squadron. W/OP King's Log book for October 1944; Honours and Awards. If you can assist with photos or any additional information about the crew members, please make contact. David King, son of W/OP C B King. Received from David King, son of W/Op C B King. The Breusch Crew at Driffield, after the death of the original Rear Gunner Higgison, but including the usual Navigator. 5. Flight Engineer Oates (both F/Engineers had flown with this crew). Front, left to right: 1. Bomb Aimer Pedley; 2. Pilot/Captain Breusch; 3. Navigator Godwin, with Observer's half-wing. No F/Sgt or W/O badges of rank are visible for King or Godwin; therefore dated after 11 Jan 1945, when W/O Godwin was Commissioned to the rank of Pilot Officer; F/Sgt King Commissioned to P/O on 29 Dec 1944. (Halifax MZ402, HD-V of 466 Squadron). From left to right: 1. not identified; 2. Bomb Aimer Les Pedley smiling at camera; 3. at rear, partially obscured, not identified; 4. not identified; 5. Rear Gunner Jimmy Higgison; 6. W/Op Bernie King, wearing cap, and still in the process of fitting his flying gear. Sadly, Jimmy Higgison was killed less than 3 hours after the photo was taken. Breusch crew reunion October 1991, all aged in their early seventies, photo taken by Nav's wife Kelly Godwin. Right: former Nav Bernard Godwin, who was known to the crew as Ferdy, so as to avoid confusion between two with the name Bernard in the same crew. Breusch Crew Memorial and Poppy Ceremony, 01 Dec 2018, by the sons of the three RAAF members of the crew. 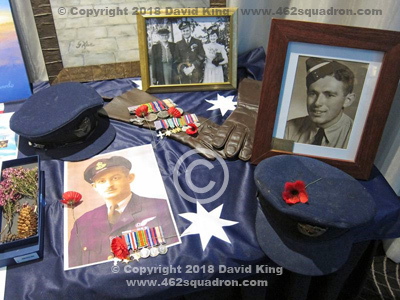 Left: B Godwin photo, post-war wearing medal ribbon bar; RAAF officer's cap; and medals including DFC. Centre back: Rex Breusch, photo believed to be taken when he was presented with his DFC by the Qld Governor at Government House, Brisbane, on 30 July 1947, with his mother (? ), and then fiancée Jill Mellor, whom he married 14 Nov 1947; also i his Medals, and miniature medals, including DFC; and his brown flying gloves. Right: C B King photo, in training as Aircraftman 2 (sometime after enlistment in May 1942), and his Officer's Cap, from 1945. Far left: The heather in the box was from Jimmy Higgison’s grave in Glasgow, and was brought back to Australia by Tiana Walker Adair, the Secretary of the 'Friends of 466/462 Squadrons’ after her recent visit there (2018). 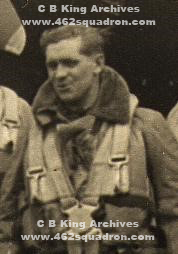 Above: Sgt James Lugton HIGGISON, 1595916 RAFVR, Rear Gunner for the Breusch Crew at 462 Squadron and 466 Squadron. Advice from W/Op Bernie King's son David, is that this photograph was cropped from a second photo of the crew in flying gear, also taken on 06 October 1944, shortly before the crew took off on their Op to Sterkrade. Jimmy was killed by heavy flak in the target area (details in later section). 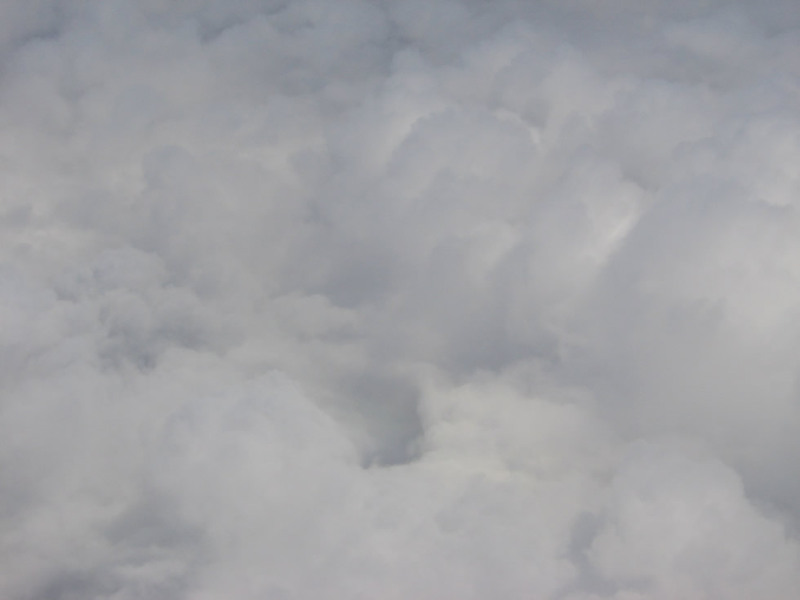 He may also be seen in the crew group photo, before take off, shown previously. Rear Gunner Sgt W A (or W H) GLENISTER 1868837 (also recorded as 1838867) RAF (VR?) of 462 Squadron, was left crewless after Pilot Black and Crew 25 failed to return from an Op on 09 October 1944. Glenister had been substituted by P/O W S Shoemaker on that Op. Six of that crew were captured as PoWs, and one crew member was an Evader. Sgt W A Glenister was incorrectly "Posted Non-Effective Missing" in the October 1944 ORB, Form 540. There is no record of Glenister's posting FROM 462 Squadron, but neither are there any later Ops recorded for him. 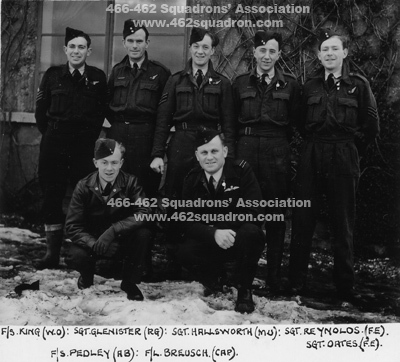 He has been identified as the same Sgt Glenister in the Breusch crew photo at 466 Squadron, and Sgt W A Glennister(sic) in the Breusch Crew in Brave & True. Flight Engineer Sgt C J (or G J or E J) Reynolds 1169328 RAF (VR?) was the Flight Engineer for Pilot Triggs and Crew 35, of 462 Squadron. That crew was split up after 06 November 1944, and Pilot Triggs, Nav Worrall and Bomb Aimer Revell were listed in Postings FROM 462 in December 1944. There is no record of Reynolds being posted FROM 462 Sqdn. Is he the same Sgt Reynolds in both of the Breusch Crew photos at 466 Sqdn? and/or Sgt C S Reynolds in the Breusch Crew in Brave & True? A comparison of the Triggs crew photo with both of the Breusch crew photos, indicates that Reynolds is probably the same person. Navigator P/O K A WORRALL 423969 RAAF, of Hourigan Crew 33 and Triggs Crew 35, was posted FROM 462 Sqdn in December 1944. He may be the same P/O K A Worrall listed in the Breusch Crew in Brave & True. The crew was was Posted TO 462 Squadron in early September 1944, from 1652 HCU Marston Moor, however their names were not included in the September ORB, Form 540 Personnel "Postings TO" the Squadron. Referring to the NAA Service File for Godwin – he was "Attached" to 462 Squadron from 04 to 19 September 1944. A Posting to 462 Squadron on 4 Sept was crossed out and marked "Cancelled". Other documents record his posting to 466 Sqdn on 04 September. Referring to the NAA Service File for King – he was also posted to 462 Squadron on 04 September, but with a similar cancellation; and re-posting to 466 Sqdn on the same date; his file also records an "Attachment" to 462 Sqn from 04 to 19 September 1944. Breusch's NAA Service File is not yet digitised, and the RAF files for the other members of the crew are not available, however it could be assumed that the same details apply to all members of this crew. After just 2 weeks with 462 Squadron, this crew transferred TO 466 Squadron on 19 September 1944, however, similar to their unrecorded arrival, their departure and cessation of "Attachment" was not included in the September ORB, Form 540, Personnel "Postings FROM". 27 November 1944 – Nav Godwin promoted to rank of Warrant Officer. 11 January 1945 – Nav Godwin Commissioned and promoted to rank of Pilot Officer, from the rank of W/O. 15 April 1945 – Godwin was posted FROM 466 Squadron TO 1652 HCU, Marston Moor for Instructor's Duties. 11 July 1945 – Godwin promoted to F/O. 29 December 1944 – W/Op King Commissioned and promoted to rank of Pilot Officer, from the rank of F/Sgt. 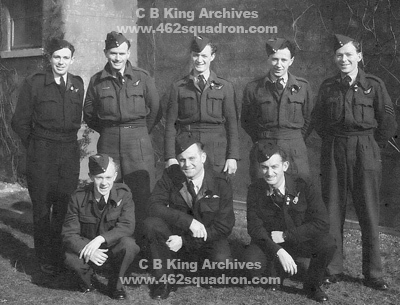 25 April 1945 – King was posted FROM 466 Squadron TO 1 (O) AFU, presumably also to take on the role of Instructor. 29 June 1945 – W/OP King promoted to F/O. We lost our dear Dad on the 21st of June 2016 aged 95 on what would have been his 73rd wedding anniversary to our Mother Velma, Dad’s nominated Next of Kin in your details. They married on June 21 1943, six months before Dad was posted to England. They met in Temora N.S.W. (my Mum’s home town) where Dad was posted as a young trainee pilot. Once in England, Dad became part of Crew 30 in 462 Squadron, and Crew 160 in 466 Squadron. He flew 37 missions in the Halifax heavy bomber serving as the wireless operator on all. His crew consisted of Australian, British and Scottish members and like all crews I’m sure, were a very tight group of young men. None closer than with his fellow Australian crew mates also from Brisbane…pilot Rex Breusch and navigator Bernard (Barney) Godwin. 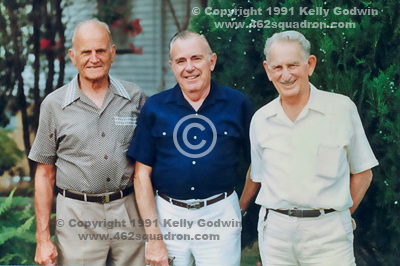 These three men remained the closest of friends after settling back into civilian life after the war, and once Mum and Dad retired to the Gold Coast at age 60, the three of them and their wives took turns each and every year to have a reunion. I have audio recordings of these reunions where they spoke of their experiences over cups of tea with their wives. Other than that, Dad never spoke of the war or his part in it with either of his two Daughters or his two Sons. He never marched on Anzac Days, but both he and Mum were very active volunteers for Legacy throughout the years. It wasn't until after Mum’s passing in 2010, the previous passing of Rex and subsequent passing of Barney that Dad, as the last Australian member standing began to speak to my Brother and I about those years between 1943 and 1945. He was a wonderful Father to his four children, Husband to my Mum, and Grandfather and Great Grandfather to the subsequent generations of children that followed. Since Dad’s passing, the Sons of the three men, My Brother Peter and I, Rex’s Son Neale, and Barney’s three Sons Brendan, Stephen and Mick get together every second year in what we call the crew memorial to honour our Dad’s lives and remember all those that served in these two Squadrons in particular. We had our most recent memorial just last Saturday (01 Dec 2018) at the Kedron Wavell RSL Club in Chermside. Dad and the rest of the crew were very sad and deeply affected by the loss of their rear gunner Jimmy Higgison who was killed in action during the Sterkrade mission of October the 6th 1944. It so happened that Sgt Glenister was Jimmy’s close friend perhaps through training. After Jimmy’s death on that mission, Dad, Rex and Barney insisted on taking Jimmy’s body back to Glasgow by train and returning his body to his parents. In fact they stayed with Jimmy’s parents in their home (which still stands there today) until after the funeral. Sgt Glenister had sought permission from his superiors to take leave of absence to travel with my Dad, Rex and Barney to Glasgow in honour of his close friend. It was during this leave of absence that his own crew went down on the 9th of October just three days after Jimmy’s death. With no crew, he was granted permission to stay with Crew 160 with 466 Squadron and served in all remaining missions as rear gunner until the end of their tour. Re the first Crew photo in the snow at Driffield, without Navigator. The navigator is missing from that crew photo because he was actually in hospital with stitches over one eye after a ‘minor mishap in a vehicle’ coming home from a dance in Driffield! The three Australians had purchased an old car which officially belonged to the pilot (Rex Breusch) who was not present on this particular night. The story goes along the lines of the car running into a farmer’s chicken coop (my Dad, Bernie King, was driving). The navigator (Godwin) bumped his head and had a cut above his eye that required a day or two in hospital. The story always came up at the reunions with lots of laughter so I guess it was just one of those funny things that happened. Ops at 462 Squadron – sourced from the 462 Squadron ORB, Form 541 "Details of Work Carried Out"
The following table lists the 5 Ops for Breusch – 1 as 2nd Pilot, and 4 with his crew (with no substitutions); one Op abandoned by Master Bomber; one early return which would not have been included in Ops tally; no other incidents. Op not counted in Ops tally. Photographic Report of target area. Photographic Report of a few incendiary tracks. LL604 Z5-D was lost on 09 October 1944, Black and Crew 25, target Bochum, 4 PoWs, and 3 Evaders. F/O Black and crew had also flown in that aircraft for 6 of their 7 Ops in September and October 1944. Ops and crew details at 466 Squadron – sourced from "Brave & True", 2nd Edition, 2007, page 148. Breusch and Crew 160, of 466 Squadron – carried out a further 34 Ops. Of the crew listed, R/AG Parry, F/Eng Todd, F/Eng Copeland were not previously in 462 Squadron. See previous section with comments regarding Nav Worrall, R/AG Glennister/Glenister, and F/Eng Reynolds. 30 September 1944 – First Op B149 at 466 Sqdn, target Bottrop. 06 October 1944 – 2nd Op B150 Halifax MZ402 HD-V target Sterkrade – R/AG Higgison KIA. "18 aircraft were detailed, 2 failed to take off. 15 aircraft attacked the target and returned safely, 1 missing. ........... No enemy fighters were seen but the heavy flak in the target area was most intense, chiefly in barrage from 15/21,000 ft. There was also a lot of predicted heavy flak on approaches into and out of the target. Many aircraft were damaged. The rear gunner in MZ-402 was killed, and rear gunner of MZ299 was wounded. ....... "
"Halifax MZ-402 Take off at 1432; landed at 1856; Bombed Primary at 1716 from 17,000 ft. Clear. Rear Gunner killed by heavy flak in target area. Photographic Report :- T/A." 466 Squadron ORB Form 540, page 95, Part 1, Operations, 06 October 1944 ..... "Eighteen aircraft detailed for daylight operation on STERKRADE – 2 non-starters (justified). Others bombed in cloudless weather. Flak intense and numerous aircraft were damaged. ....... "
In Brave and True, page 308, Bomb Aimer Les Pedley recorded detailed information about that raid on Sterkrade, and of the death of his crew mate james Higgison. He finished with the words "the memory stays with me always". Jimmy's body was taken to Glasgow for burial at Riddrie Park Cemetery. On the same daylight Op to Sterkrade, Pilot Ted McGindle and Crew 19 of 462 Squadron were also hit by flak – details on Ted's page. More information to be added – please visit again. 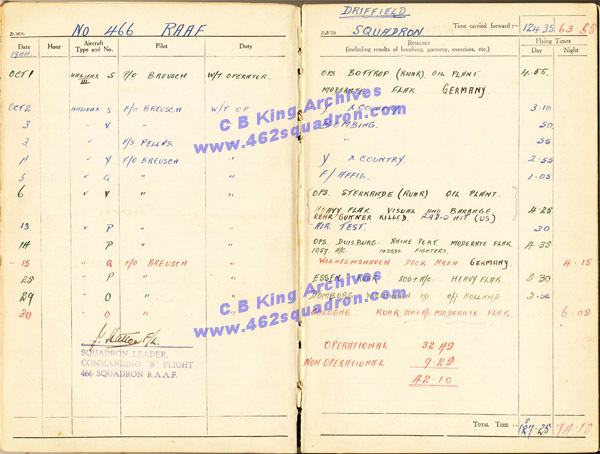 Log Book page for October 1944 – W/OP Bernie King. Entries in black ink were daylight Ops; entries in Red ink were night Ops; and entries in blue ink were non-operational flying (i.e. Cross country x 2; bombing x 2; fighter affiliation). 01 October 1944 – Op 1 – Target – Oil Plant, Bottrop in the Ruhr; moderate flak; 4 hours 55 minutes. 06 October 1944 – Op 2 – Target – Oil Plant, Sterkrade in the Ruhr, heavy flak, visual and barrage, Rear Gunner killed; radio hit (US); 4 hours 25 minutes. (US – unserviceable, Rear Gunner was Higgison). 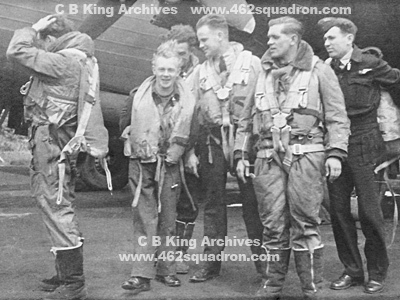 The crew in their flying gear were photographed prior to take-off, so sadly a few hours later, Higgison had died of head injuries due to flak. Pilot Breusch and Navigator Godwin were each awarded a Distinguished Flying Cross. Bomb Aimer Pedley was awarded Distinguished Flying Medal.